Ground Penetrating Radar Systems, LLC. 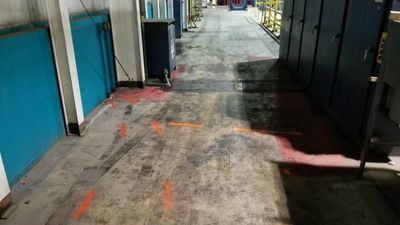 of Phoenix, Arizona was contacted by a local Environmental firm to clear some areas inside this factory so they were able to drill for soil samples. When doing this type of locate we need to utilize two types of scanners so that we can see what lies within the concrete and what lies beneath it. This factory has a bunch of machinery that requires a bunch of electrical to operate it and the last thing you want to do is to drill through a live conduit and potentially hurt someone or even to shut down part of the factory. GPRS was able to use multiple methods of locating to be sure that the drillers would not drill through an underground utility line. It was a good thing that they hired us because otherwise they would have drilled right through some main power in a few of there locations. Anytime you need to penetrate the ground or through concrete then you should always contact GPRS to make sure that particular location is clear of obstructions. If you are interested in learning more about our concrete imaging capabilities or other Ground Penetrating Radar applications such as locating Utilities and sub-surface anomalies along a proposed pipeline trench, locating Underground Storage Tanks (USTs), clearing boring locations of possible Utilities for soil samples, Void Detection or even structural investigations. Don’t hesitate to contact us for more information or to hire us for your next project no matter how big or small the project may be. Ground Penetrating Radar Systems has an office local in Phoenix serving all of Arizona as well as having offices all across the U.S in all major cities and states. Please feel free to contact Troy Bullock with the Phoenix office at (480) 493-6157 or email him at troy.bullock@gprsinc.com.